As the eating trends of people keep changing, and we are becoming more health conscious, it is always good to know what we can eat; especially for breakfast considering its importance to kick start our day. We can break from our monotonous breakfast like South Indian, North Indian varieties and cereals like corn flakes and oats, to make a healthy addition. Muesli is one of the delightful cereal options made from a blend of crispy cereals like corn, malted wheat flakes, rolled oats with crunchy and chewy nuts like almonds, and fruits like raisins, apple, pineapple, strawberry, dates, papaya, peach etc. This is a wholesome dish that is power packed with energy, protein, vitamins and minerals required for the morning, which can be consumed by all age groups. Nutritionally, nuts also add a lot of fat, but a high proportion of this fat comes from mono and polyunsaturated fatty acids. There are various brands available in the market like Bagrry's, Kellogg's, Good Earth, Jainy's etc. Many of these brands come to the market with manufacturers' claims of natural vitamins, minerals, proteins, zero cholesterol, high fiber(soluble and insoluble) and energy galore (sustained and instant). These nutrients can help to lower cholesterol, control weight, help in digestion, prevent cardio vascular diseases & obesity, maintain glucose level in the blood, and so on. From the health expert's point of view, although no single food can make a person healthy, muesli offers many health benefits. 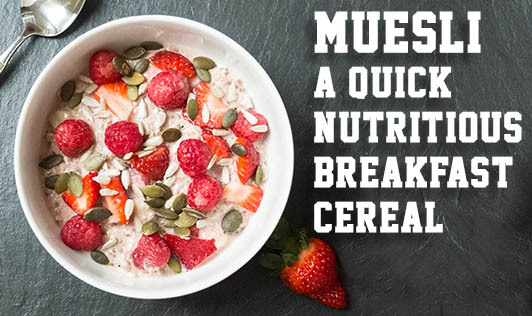 Muesli is one of the healthy breakfast options which requires no preparation and can satiate hunger. 1. Muesli can be enjoyed with either hot or cold milk. 2. It can be eaten with low fat or fat free curd or yogurt. If you wish to gain weight, a spoon of peanut butter can be added. 3. Its yummy when added as a topping for ice-cream, fruit salad, vegetable salad, pudding or custard. 4. It can work as a wonderful snack between meals. All-in-all a crunchy, trendy and healthy cereal variety that can be eaten anytime. But be careful not to over load your bowl. Do share some of your creative Muesli recipes with us!! !